2. Communicate with all officers on a quarterly basis. 3. Represent ITCCCA at IHSA Advisory board meetings for track & field and cross-country. 4. Serve as master of ceremonies at the January clinic. *It is a two-year office voted on by the members. 2. After the two-year term he/she will become the president. 3. Will oversee the following offices; Senior all-star Meet Directors (Male & Female), The Mid East cross-country Meet Directors (Male & Female), Directors; Hall of Fame Chairman, All state Cross-Country, Coach of the Year Awards, Pasquini Awards, Recognition Awards, Historian, All State Track & Field, Fall Meeting Facilitator and John Davis Scholarship Director Junior High School Representative, Officials Representative, Video Rental Director, ITCCCA Tidbits Editor, City of Chicago Representative, Class A Representative and IHSA Representative. Responsible for all financial matters of ITCCCA. 2. Keep track of the financial books. 3. Collect ITCCCA membership dues. 4. Dispense funds to members with receipts for ITCCCA matters. 5. All reports and records should be kept on a PC format. 6. Run registration for the January clinic. Record the All State selections on a PC format. 2. Obtain and record the top three performances at the boys and girls state track meet. From these performances pick the top three, regardless of A or AA classifications. These athletes will be designated as the All State Athletes in their events. 3. Obtain certificates for each of the All-State award winners. 5. Pass out the list of All-State athletes at the early fall meeting and January clinic. 6. Forward a copy of the All-State athlete list, including the athlete’s hometown and school, to the Publicity Director, Historian, Web Page Director and ITCCCA Editor as soon as possible after the state meets series. Please include the athletes hometown, and school. 7. The president appoints this position; there is no time limit on serving. Send out various e-mail issues of the ITCCCA Tidbits Newsletter. 2. Send out at least one mailing a year to all schools. This should be in November or December to help publicize the clinic. 3. All officers should e-mail pertinent information to the Editor to be dispersed to the membership. 3. The president appoints this position; there is no time limit on serving. This position requires two coaches, one for the guys’ team and one for the girls’ team. They are responsible for making all arrangements for the Mid East cross-country Meet. 2. This includes obtaining the runners, recruiting extra coaches, transportation, housing, entry information and any other jobs associated with ITCCCA participation in the meet. 3. Compile the final results and send them to the Vice President, Publicity Director, Historian, ITCCCA Tidbits Editor and the Web Page Director as soon as possible. Please include the athlete’s name, hometown, school and telephone number. 4. If possible please keep all records in a PC format. 5. The president appoints this position; there is no time limit on serving. Responsible for organizing the Hall of Fame committee meeting that picks the individuals for induction into the Hall of Fame. 2. Responsible for organizing the Hall of Fame committee meeting that picks the individuals for nomination. This includes preparing all papers necessary to help the committee chose new inductees at a committee held on the Sunday before Columbus day. Run the portion of the meeting to vote on the Hall of Fame inductees. 4. Contact all members that are elected to the Hall of Fame for that year. Also, contact the individuals who will be introducing them. 5. Run the Hall of Fame portion of the clinic. 6. Contact current members to inform them of the Hall of fame luncheon. 7. Compile the names, including hometown, school and telephone number, and send them to the Vice President, Publicity Director, Historian, ITCCCA Tidbits Editor and the Web Page Director as soon as possible. 8. If possible please keep all records on a PC format. 9. This position is a permanent position. The president will appoint a new chairman with the current committee’s recommendation if the current chairman resigns from the position. Select the top 25 boy and girl finishers at the state meet regardless of class affiliation. Obtain plaques for each of these individuals. These plaques should be passed out at the late fall ITCCCA meeting. 3. Compile the All-State team names and send them to the Vice President, Publicity Director, Historian, ITCCCA Tidbits Editor and the Web Page Director as soon as possible. Please include the athlete’s hometown and school. 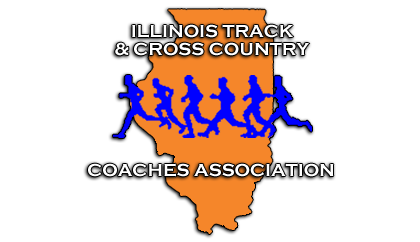 Illinois Track and Cross Country Coaches Association awards Athlete-of-the-Year honors to Illinois Track &Field/Cross Country athletes who have demonstrated remarkable achievements. At least, one male and one female will receive this award annually. This award was started in 2010. The recipients are selected by a committee of coaches and media who are member of the track & field /cross country community throughout the State of Illinois. The award, presented at the January Clinic, is open to all track & field/cross country athletes in Illinois. Responsible for creating, distributing, collecting and determining the winner of Coach of the Year Ballots. Responsible for obtaining the coach of the year plaques. 2. Responsible for awarding these plaques at the annual ITCCCA luncheon. 3. Send letters notification to the award winners. This award is decided for 1A, 2A and 3A boy’s cross-country, girl’s cross-country, boy’s track and girl’s track. 4. Compile the names and send them to the Vice President, Publicity Director, Historian, ITCCCA-N Tidbits Editor and the Web Page Director as soon as possible. Please include their hometown, school and telephone number. 5. If possible please keep all records in a PC format. 6. The president appoints this position; there is no time limit on serving. Collect all recommendations for the Dave Pasquini Award. 2. Go through the recommendations and bring the top ten choices along with summaries to the officers meeting in November. 3. Run the voting for the award winners at the November meeting. 4. Contact all the award recipients and invite them to the luncheon in January. 5. Run the Pasquini Award portion of the January luncheon. 6. Compile the names and send them to the Vice President, Publicity Director, Historian, ITCCCA-N Tidbits Editor and the Web Page Director as soon as possible. Please include their hometown, school and telephone number. 7. If possible please keep all records in a PC format. 8. The president appoints this position; there is no time limit on serving. 1. Responsible for the current maintenance of the ITCCCA web page. 2. Responsible for continually developing ways to improve the Web Page. 3. This position is becoming increasingly important. The Web page is the communication line of our organization. We cannot afford for it to become outdated or inoperable. Because of this fact there will be an assistant Web Page Director who will assist the Director in his/her duties. 4. Different officers are responsible for providing information, and the director is responsible for getting it on the web page as soon as possible. Develop, disperse and collect all the applications for the scholarship. 2. Create a committee to go through the applications and decide on the recipients. The number of scholarships will be awarded based on the amount of available funds for that year. 3. Compile the names of the scholarship winners including hometown, school and telephone number, and send them to the Vice President, Publicity Director, Historian, ITCCCA-N Tidbits Editor and the Web Page Director as soon as possible. 4. Notify the recipients of their award. 5. Notify the principals of the respective schools. 6. If possible please keep all records on a PC format. Oversees all aspects that relate to the ITCCCA January clinic. 2. Obtains speakers for the clinic. 3. Determines time schedule and room assignments of all clinicians. 4. Coordinates the jobs of the Clinic Facilities Director, Vendors Director, Reception Director, Clinic Gifts Director and Hall of Fame Receiver. Responsible for obtaining vendors for the January clinic. 2. Responsible for arranging with the Web Page director to put the vendors link on our page. 3. Responsible for collecting monies from the vendors and giving that money to the Financial Director. 4. Responsible making sure vendors have assigned areas at the clinic. Responsible for arranging the thank you gifts for each clinician. 2. Responsible for arranging for the item that will be given to each attendee. 3. Assist the Vendor Director with collection of the door prizes. 4. The president appoints this position; there is no time limit on serving. Work with the hall of fame committee in determining who will be in attendance. 2. Greet the Hall of Fame members and give them their special nametag and other material. 3. Be sure the Hall of Fame members and their families find their seats. 4. Work with the Historian to get a picture of the inducted HOF class and of all the HOF’s in attendance. Keep ITCCCA informed about what is going on with USATF both nationally and locally. 2. Keep ITCCCA aware of changes that may be advantageous to ITCCCA and its coaches. 3. Keep USATF informed about what ITCCCA doing and how it may help USATF. 4. Work with the presidents of USATF Illinois and ITCCCA to bring about even better cooperation between the groups.